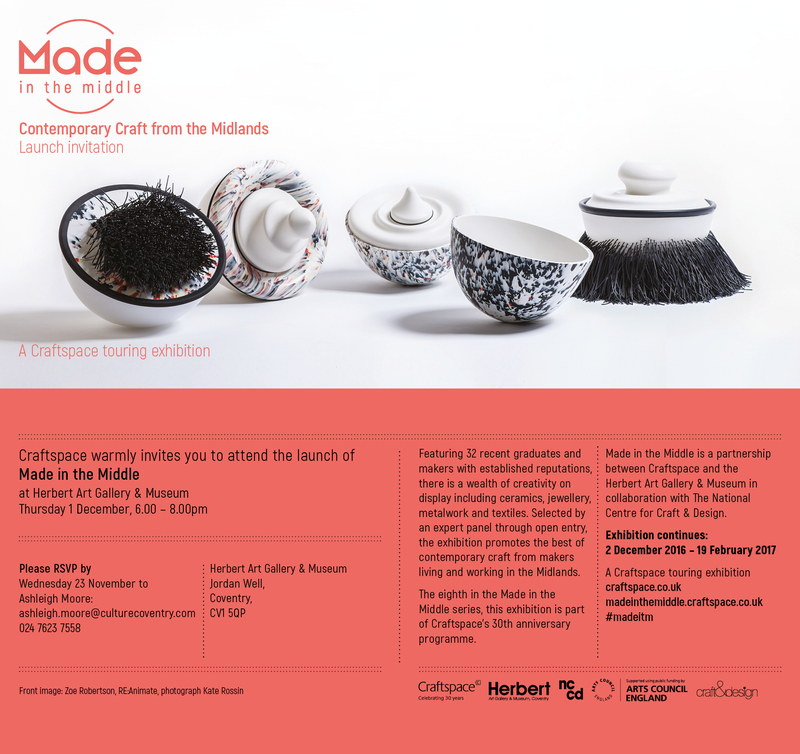 Please join us to celebrate the launch of Made in the Middle exhibition featuring a brand new installation by Interlace on Thursday 1st December. We’ve been busy expanding and developing our large scale installation pieces ready for the Knitting & Stitching Show 5th-9th October (and touring to Dublin and Harrogate). In addition to our exhibition you can join us for talks & workshops. Book for these online via the links or at the show at the workshops desk. A new concrete and cloth installation has been unveiled in Leicester’s cultural quarter, made by two East Midlands artists and young people from Leicester. 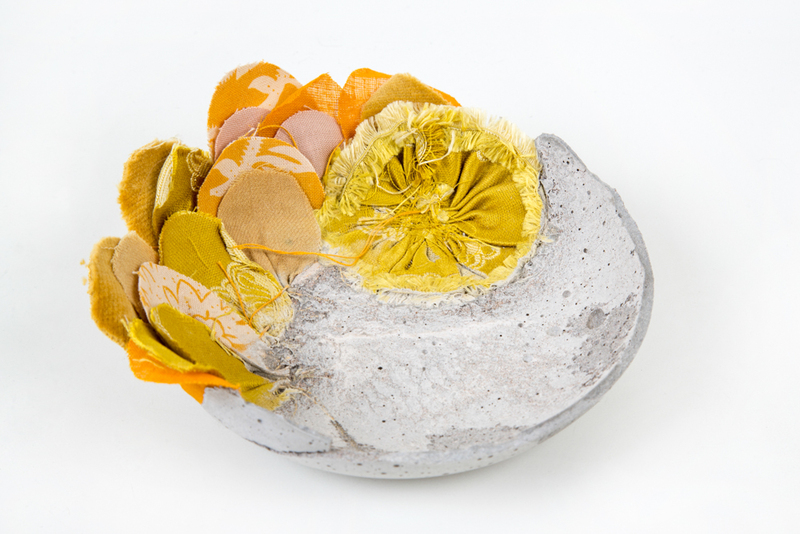 Textile artists Ruth Singer & Bethany Walker, trading as Interlace, have been working together since 2014 creating innovative installations of colourful bowls made with concrete embedded with cloth which have been exhibited in galleries across the Midlands. 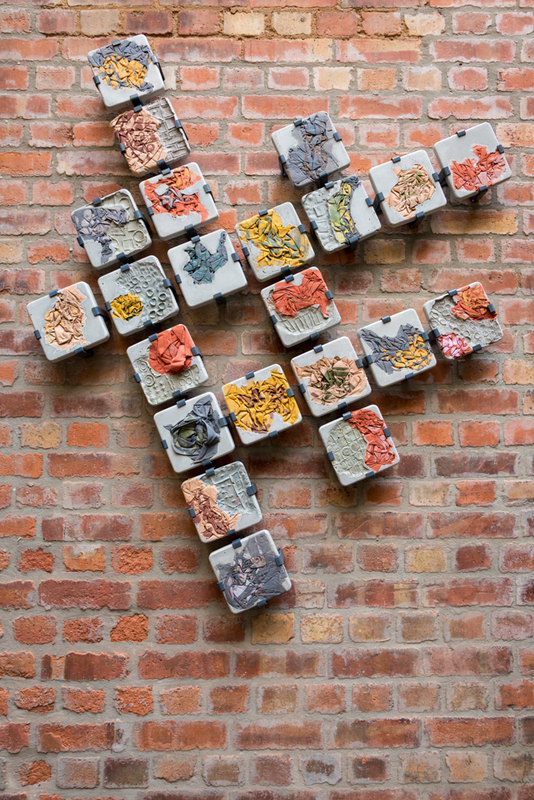 Community collaboration has always been a key aim of the collaboration and they are delighted to present their first major project installed at Makers’ Yard artist studios in Leicester’s cultural quarter. Interlace partnered with The Contact Project to work 8-13 year olds from a culturally diverse and economically deprived area of the city, right on the doorstep of the cultural quarter. The aim was to create links between the two areas, divided by the ring road, and celebrate the hidden beauty of the urban environment. Funding was provided by the Joyce Carr Doughty Trust. Working with the professional makers gave the young people an insight into the research, design and process artists use to create their work. The project content was developed by Interlace to have as much input from the young people as possible, whilst maintaining a strong design concept and excellent finish. The design work took place over several weekly sessions and included a photo walk looking at design details on the half-mile walk between the groups’ community base and the artists studio, and collecting pattern, shape and colour ideas. Pattern and drawing skills also came into play as the young people used brick and paving tessellation designs to create ideas for the finished tile layouts. They created texture design boards using magazines and their own rubbings of building materials and learned colour theory and mixing to create palettes based on their photos. 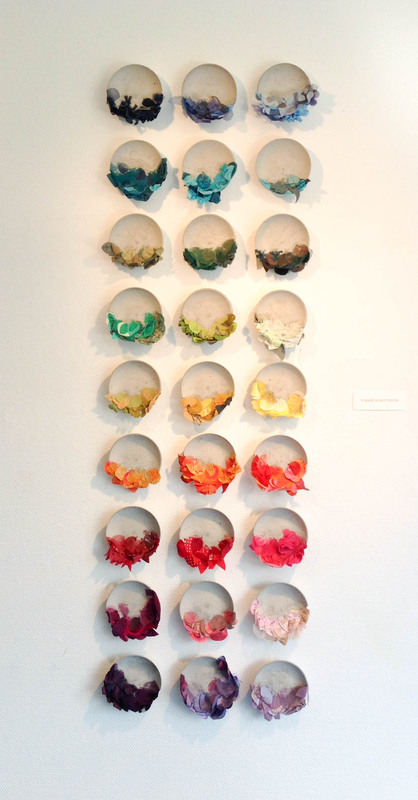 From this work the artists chose the colour palette and fabrics for the finished work. To create designs for printing on to the fabrics, the young people experimented with mark making, again using their own photographs for reference. Silk screens were made up use the mark making which the young people then printed onto fabrics, using the colours developed in the previous session. Ruth taught some simple stitched fabric manipulation techniques to create texture in the fabric. 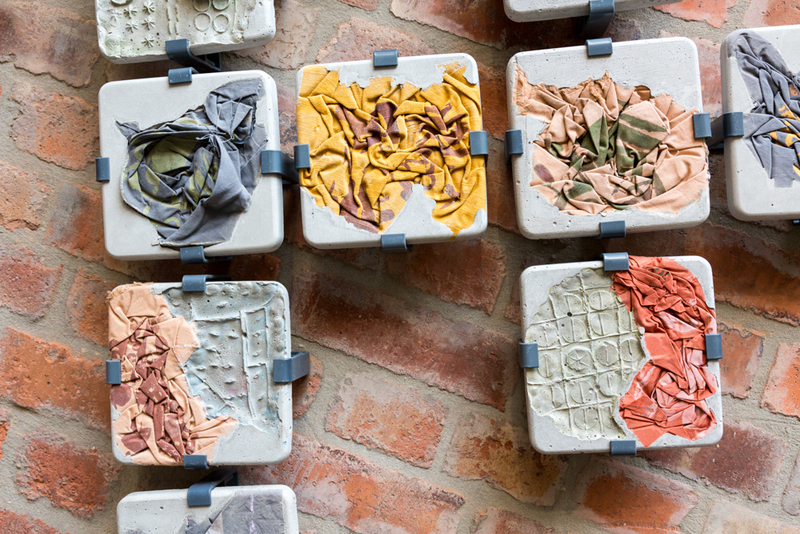 In the final session the young people worked with Bethany set the manipulated fabric forms into moulds with concrete to create the finished tiles. 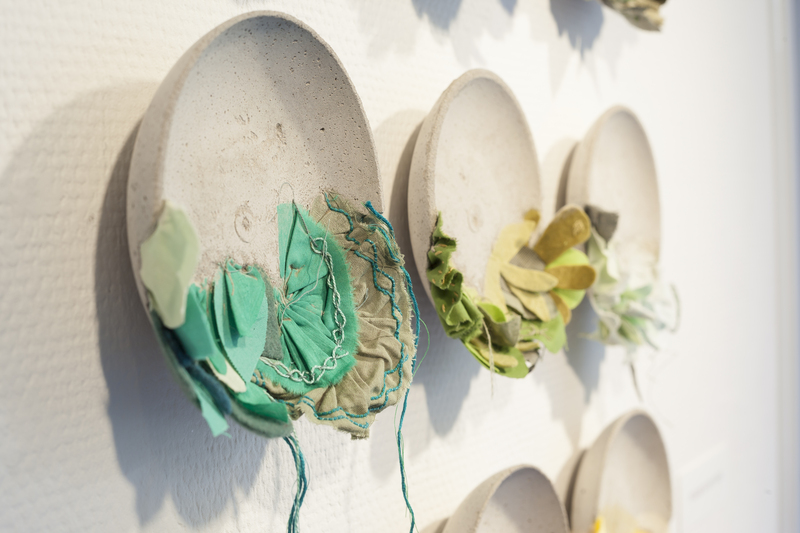 Once the young peoples’ work had been completed, Ruth & Bethany worked to create the final piece with a specialist design and installation team. A celebration party for the young people took place in June, when they saw the finished tiles for the first time. 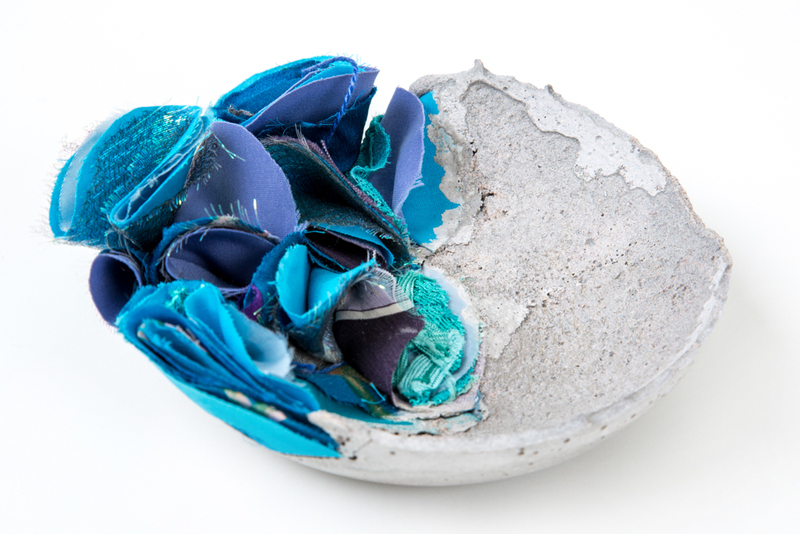 Ruth Singer & Bethany Walker came together in 2014 to create innovative sculptural work made from an exciting combination of cloth and concrete. 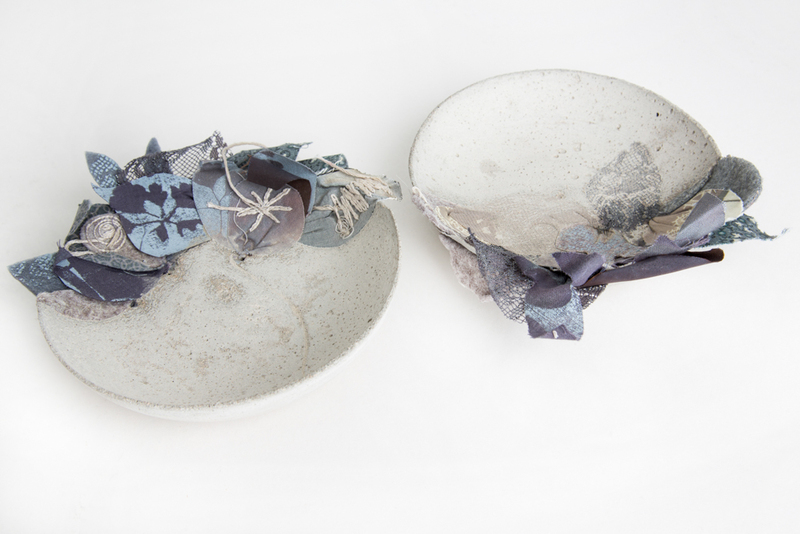 Their brand, Interlace, is going from strength to strength, having taken part in exhibitions at Bilston Craft Gallery, The National Centre for Craft & Design and Unit Twelve in 2015. 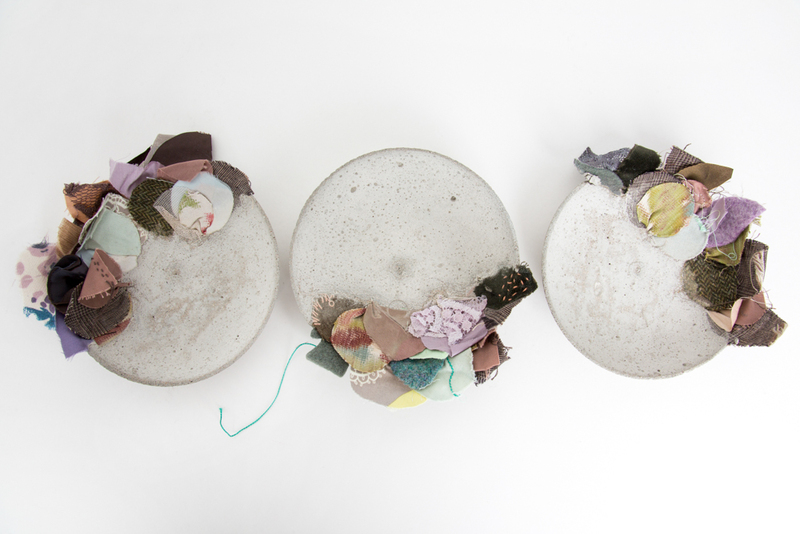 In 2016 they will be taking part in Craftspace’s high profile touring exhibition Made in the Middle and hosting a solo exhibition at the three Knitting & Stitching Shows in London, Dublin and Harrogate. 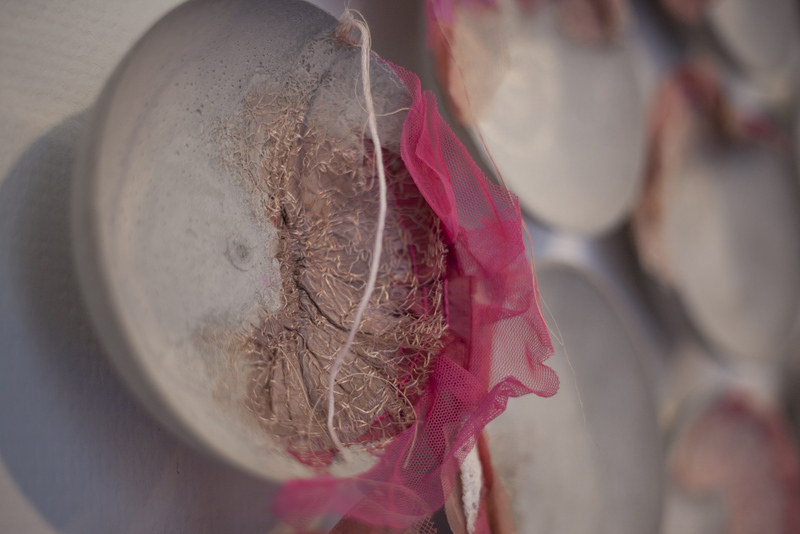 Professional high res photographs of the installation, the artists and the creative workshops are available on request. To reward ourselves for Interlace’s recent successes we recently treated ourselves to some creative time in the form of a mark making session – it was so much fun! The plan is to have more creative days like this again very soon. These mark makings have now been put onto silk screens for printing on textile and will form the basis of a new collection which will be launched at Craftspace’s Made in the Middle exhibition later this year. 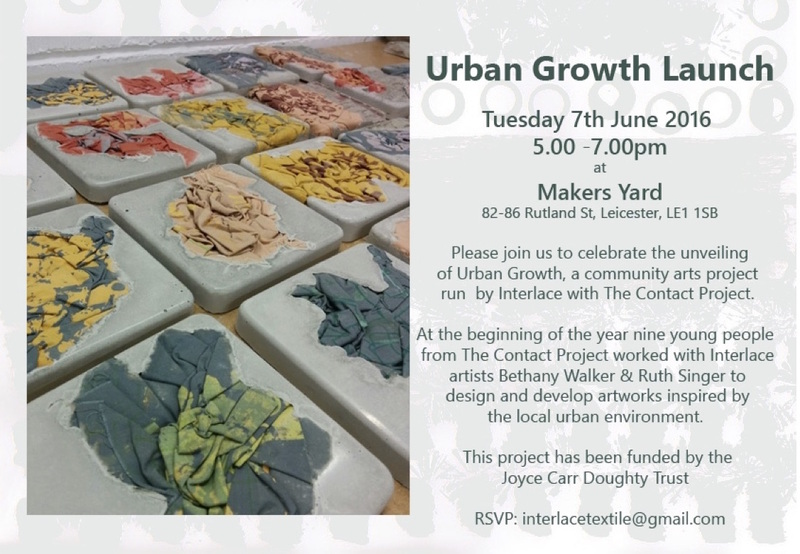 Our first major project, Urban Growth, launches on 7th June at Makers’ Yard, Leicester. Please join us to celebrate and see the finished installation of cloth and concrete tiles. 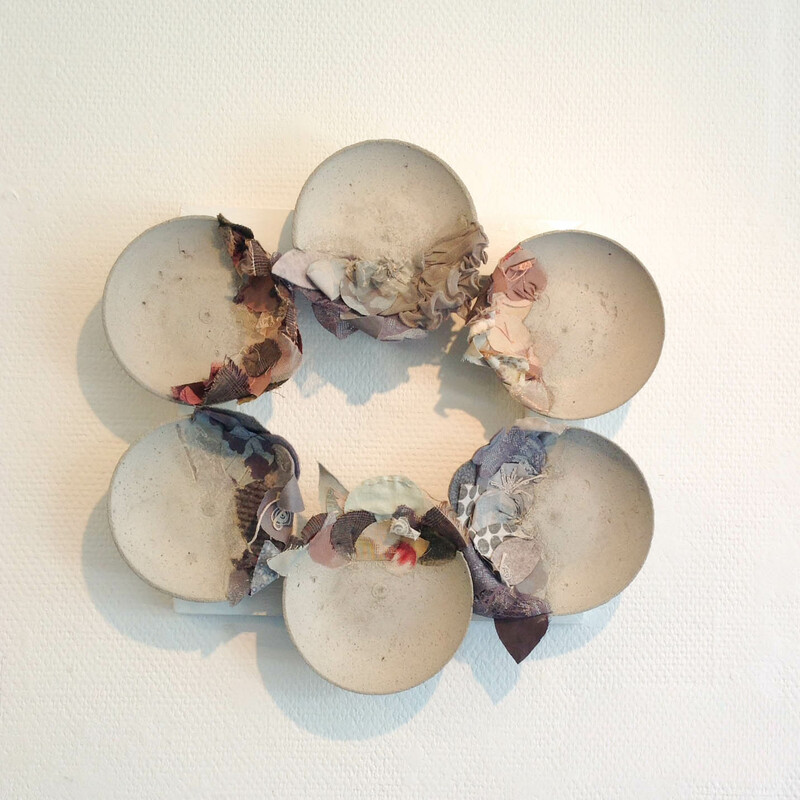 This piece has ben selected for the Leicester Arts & Museums Open 27 exhibition at New Walk Museum, 12 March – 8th May 2016. This month we have started an exciting project working with 8-13 year olds in Leicester city centre. We have been funded by the Joyce Carr Doughty Trust to work with the Contact Project, a charity focussing on providing young people with creative learning and support. 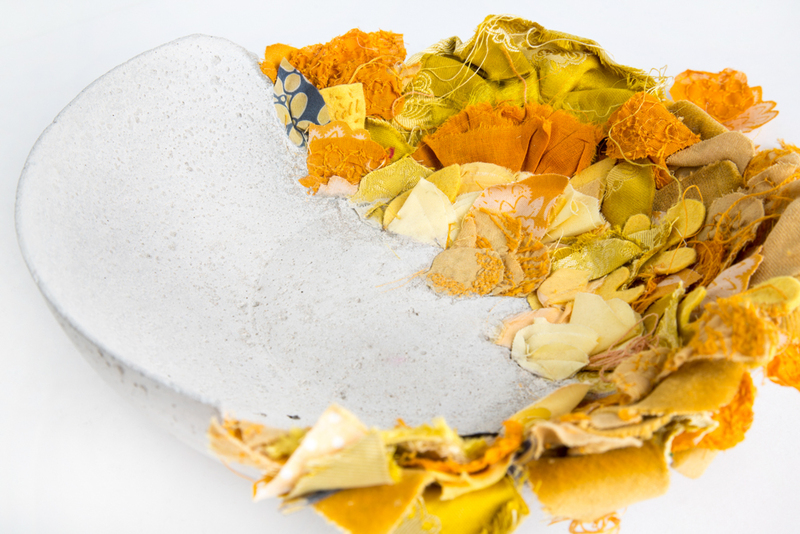 Over six weeks, we are working with a group of young people to research, design and create an original collaborative art work which will be displayed in Makers’ Yard. This week’s session involved a photo walk between the Contact Project and Makers’ Yard, exploring urban details which we will use in our design development. We also turned out the first test pieces of concrete made last week, and worked on our design ideas using the photographs taken.